I have a love hate relationship with my apartment. Love: This weekend we explored some tide pools, biked around the bay, and did a little shopping – all within 5 miles of our little apartment. It’s hard to beat the location. Hate: My kitchen has been a complete and total disaster since the weekend we got home from China. It’s so tiny it’s nearly impossible to keep up with mess. You would think a smaller space would mean a smaller mess. But no. It means there are lots of dishes, baking supplies, food items, and other kitchen goods that have to be kept in places other than the kitchen. Also, things kept in the kitchen can have only one very specific place where it can be stored. Pots and pans have to be stacked in a very specific order and turned in a very specific direction so as to leave room for the very specifically stacked colanders to be placed in front of them. What’s that have to do with a messy kitchen? Welllll, I guess it comes down to laziness – no wait that sounds bad, busyness. I’ve been so busy and going right from one project to the next that things just don’t have time to be put back in their proper and specific place. There is no sense in walking the spare mixer bowl to the bedroom closet just to have to pull it back out later. Just in the time that I’ve been home I’ve made Lasagna, Lemon Greek Chicken, Black and Tan Brownies, Banana Oat Muffins , Whole Wheat Bread, my birthday cake (talk about a mess! ), this Chipotle Pulled Pork, and of course a few other favorites. That makes for one messy kitchen. It’s been worth it, though. Especially for this meal. 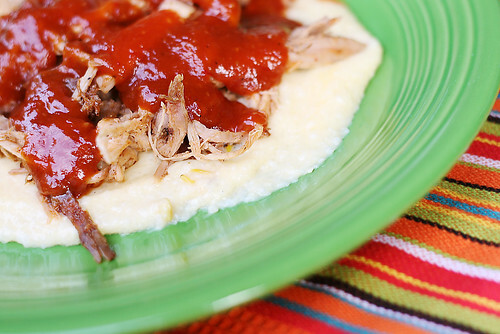 This pulled pork was awesome, even better when paired with cheesy grits with roasted corn. Don’t be scared off by the coffee in the rub. It doesn’t taste like coffee. It just adds depth to the flavor. Rub the Coffee-Chipotle rub all over the pork roast. Place the roast in 5-quart dutch oven (or other oven proof pot/pan with a lid) and pour the water around the roast. Cover with a lid and roast for 4 hours. At 4 hours remove the pan from the oven and pour most of the liquid off into heat proof measuring cup and set aside. Stick a fork in the middle of the roast and give it a jiggle. If the meat is still tough (doesn’t start to fall apart when you stick the fork in the middle) return the pan to the oven and roast for another hour. Check again with a fork and continue roasting until it’s ready (mine took 5 and half hours). When the pork starts to fall apart increase the oven temperature to 400 degrees. Shred the pork with 2 knives and pour 1/2 cup of BBQ sauce over it. Return to the oven for 15 minutes until the BBQ sauce starts to glaze over the pork. Serve on buns with cole slaw or over cheesy grits. Combine all ingredients together until it is thoroughly combined with no lumps. If you’re using the chipotle pepper instead of the powder, rub it into the other ingredients with your fingers (and make sure to SCRUB your hands when you’re done!). Place all of the ingredients in the bowl of a food processor and process until smooth. Pour into a saucepan and simmer over low-heat for 30 minutes before serving. 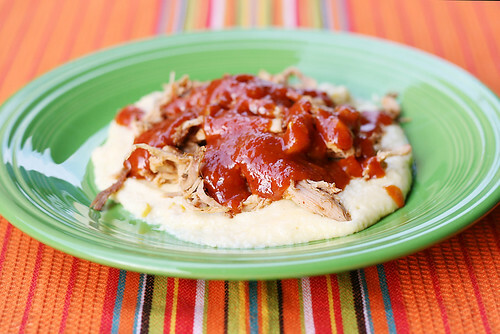 >I would have never thought to serve pulled pork over cheese grits, what a great idea. >Pulled pork is one of my favorite dishes and the bbq sauce recipe sounds awesome. Bookmarked-thanks for sharing this tasty dish.